The diverse properties of castable polyurethane make it the leading choice of engineers looking for long lasting materials for their high load, high stress environments. Polyurethane routinely outperforms plastic, rubber and steel in its overall ability to resist harsh environmental factors such as abrasion, heat, solvents, oil and acid. In addition, polyurethane‘s noise abatement ability makes it the preferred material in chain-drive designs, conveyor belt systems and assembly line environments. In today’s manufacturing environments where the cost of downtime is measured in thousands of dollars per hour, polyurethane’s incredible durability actually increases your company’s profitability. This page includes detailed information on polyurethane properties. 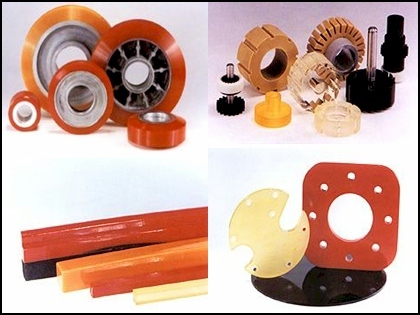 The physical properties of polyurethane are considerable. Polyurethane performs well for hardness, tensile strength, compression strength, impact resistance, abrasion resistance and tear strength. The chart below show the physical properties of polyurethane. * The D Scale is used to measure durometer hardness above 95A by Shore, Rex, or Wallace durometers. The graphic on the left shows the relative hardness ratings available with polyurethane versus rubber and plastic. As you can see polyurethane is an extremely versatile substance. Best of all, polyurethane parts have longer service lives than those made from rubber and plastic. The chemical resistance of polyurethane is broad across multiple substances. The table below shows the oil,chemical & solvent resistance of polyurethane to a sampling of substances.